Sunrise on the Usumacinta River. Guatemala is not an easy country to grasp on your first visit. 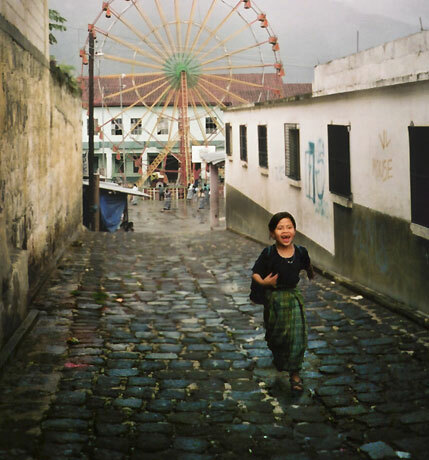 There’s nothing obviously “Guatemalan” connecting the variety of terrain and life and cultures found within its borders. The popular image of volcanoes, coffee plantations, and indigenous women in colourful costumes selling handicrafts represents only part of the puzzle. And travelling slowly by bicycle is the best way to get a feel for this strange little country. 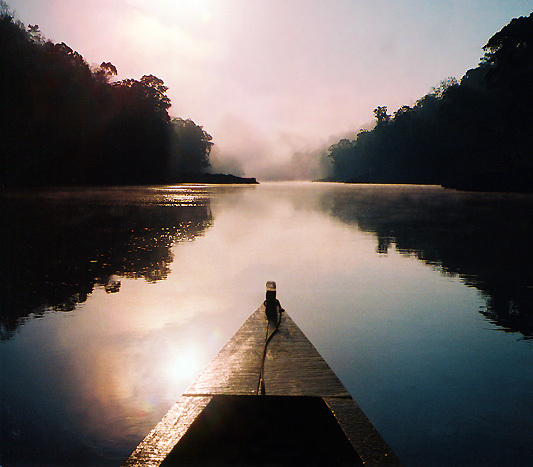 The most peaceful (and most scenic) way to enter Guatemala is by crossing the Usumacinta River from Mexico. From tiny, dusty Frontera Corozal (also still known by its former name, Frontera Echeverría), you must hire a small boat to take you upriver to even tinier and dustier Bethel on the Guatemalan side. I crossed at dawn when the mist was still hovering over the water and the howler monkeys were beginning their morning roar. At the customs office in Bethel I had to wake the guard who was fast asleep in a hammock on the other side of the desk. Along with my passport stamp, I got a hearty handshake and a warm “bienvenido” to Guatemala. 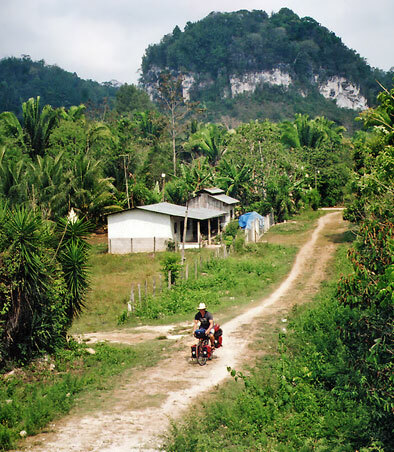 Rural riding in the Petén. 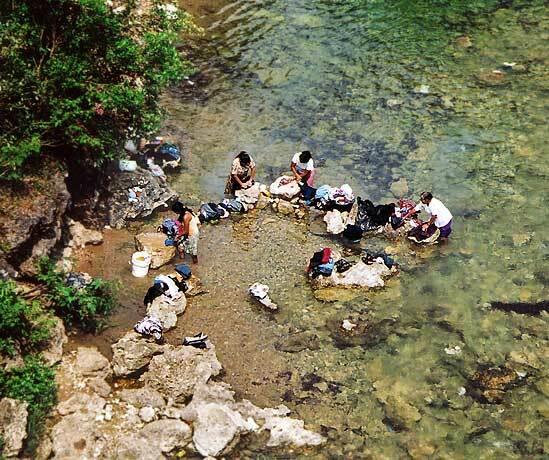 Petén, the name of the department on the Guatemalan side of the Usumacinta, covers a third of the country. It’s hot, humid, lush, and flat (well, flattish). A lot of Petén has been converted to farmland. The rest is covered in deep jungle. The famous Mayan site of Tikal is here and it more than lives up to the hype. I always visit Tikal when I’m in this area and it never ceases to amaze. More amazing still, the northern jungles of Petén hide even larger Mayan cities yet to be unearthed. Petén is loaded with surprises from the ancient world. Don’t miss the little Mayan site of El Chal, 50 kilometres south of Flores. It’ll seem tiny if you’ve just been to Tikal, but it’s free and you’ll probably be the only human there–just you and the howler monkeys. When I was here they put on a big, noisy show, roaring and throwing small branches at me. Most visitors spend all their time in the highlands around the groomed-for-Gringos colonial town of Antigua and the ruined-for-Gringos Lake Atitlán. Then they book a side trip to the Mayan archaeological site of Tikal, 400 km north. What they always fail to notice is how much Guatemala changes between these two points. And how much more it changes beyond. Obviously, I’m not suggesting you avoid the Guatemalan highlands. The mountain scenery and Mayan culture are colourful and memorable and it’s one of the most distinctive parts of Latin America. Unfortunately, the flood of foreigners to this region has not only tainted much of the charm but also attracted thieves, making it one of the easiest places to get robbed in all Latin America. Guatemala has 250 km of Pacific coast and a small-but-vibrant Caribbean, home to the country’s black Garífuna culture. 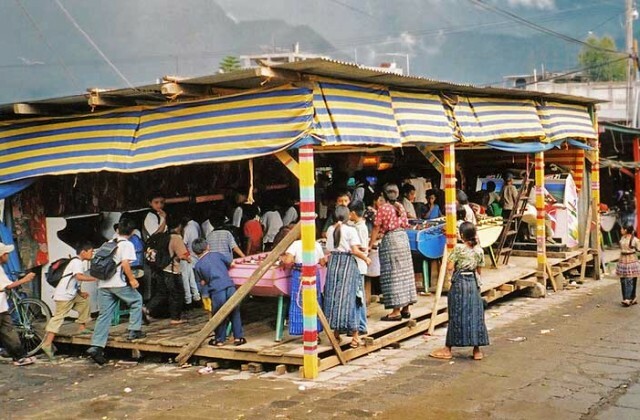 Beyond the Garífuna and the indigenous descendents of Mayans–most of whom still use their native languages–Guatemala is largely ladino, a term Guatemalans prefer to mestizo when describing Guatemalans of mixed native and Spanish descent. Most of the Guatemalan ladinos I’ve met are easy-going, approachable, and friendly. They seem to genuinely appreciate the interest in Guatemala shown by travellers, especially cyclists. Feature image (top of page): Arcade in San Pedro.